Today, the Fourth of July, marks the joyous day when Americans celebrate their freedom. But Khalid Durán of Bethesda, Maryland, has little cause for celebration. For, in an eerie echo of the Rushdie affair, the death of this freethinking Muslim has been called for by an Islamist (or fundamentalist) leader living in the Middle East for a book he has written. Khalid Durán, author and specialist on Islam. Durán, 61, is an accomplished scholar and original thinker. Born of a Spanish mother and a Moroccan father, he speaks five languages and was educated in Spain, Germany, Bosnia, and Pakistan. A German citizen, he has lived in the United States since 1986, teaching and writing mostly about Islam at leading universities and think tanks. Durán has written six books and is a leading analyst of Islam and politics, an authority on the current wave of Islamism and an expert with an excellent record of predictions. Durán is also an activist on behalf of causes like the revival of Afghan culture and the promotion of dialogue between the three major monotheistic religions ("trialogue"). He now heads the IbnKhaldun Society, a cultural association of moderate Muslims opposed to Islamism. His is a rare and welcome voice of Muslim liberalism at a time when radicals dominate the mosques, the media, and the counsels of state. Given this background, it was natural that when the American Jewish Committee (AJC) sponsored a book called Children of Abraham: An Introduction to Islam for Jews, it sought Durán out to write the volume, and that he accomplished this task with distinction. Fourteen scholars of Islam approved the manuscript prior to publication; in addition, it won glowing reviews from such authoritative figures as Cardinal William Keeler of Baltimore, the eminent church historian Martin Marty, and Prince Hassan of Jordan. Then, just as the book was being readied for release, the Council on American-Islamic Relations (CAIR) weighed in. This fringe Islamist organization promotes a Khomeini-like agenda but has the smarts to hide its extremism. 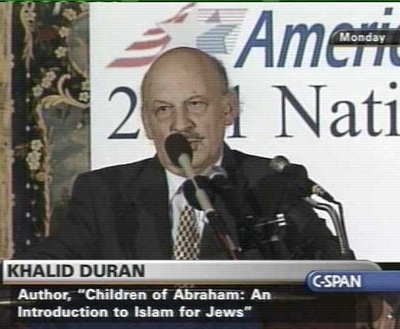 It issued two press releases in which it insulted Durán personally and demanded that Children of Abraham be withheld until a group of CAIR-appointed academics review the book to correct what it assumed (without having read the manuscript) would be "stereotypical or inaccurate content." CAIR being part of an international network of Islamists, like-minded publications in the United States, Europe, and the Middle East quickly picked up its message. With the retelling. naturally, the story hardened. Thus, Cairo's Al-Wafd announced that Durán's book "spreads anti-Muslim propaganda" through its "distortions of Islamic concepts." The campaign of vilification culminated in early June, when a weekly in Jordan reported that 'Abd al-Mun'im Abu Zant, one of that country's most powerful Islamist leaders, had declared that Durán "should be regarded as an apostate" and on this basis called for an Islamic ruling that "religiously condones Durán's death." Days later, Durán's car was broken into, with a dead squirrel and excrement thrown inside. And CAIR, far from apologizing for the evil results of its handiwork, has the gall to accuse the AJC of fabricating the death edict as a "cheap publicity stunt to boost book sales." Abu Zant was applying the "Rushdie rules" that Ayatollah Khomeini had established back in 1989, whereby anyone critical of Islam or Islamism is liable to be fined, jailed, or perhaps threatened with death. Already applied in most Muslim countries and many Western ones (Canada, Holland, France, Israel), these rules now threaten to be extended to the United States. Actually, they already have been applied: in 1990, not long after the Council of Religious Scholars in Mecca called Rashad Khalifa an infidel, thereby marking him as someone to be eliminated, this Egyptian immigrant living in Tucson, Arizona, was murdered by members of an extremist Islamic group. It bears noting that CAIR has never denounced his assassination. The threat against Durán requires that all of us, whatever our politics or religions, stand together as one and with a loud, clear voice condemn Abu Zant's threat and reaffirm the sanctity of free speech. In this case, if Americans truly do join forces, they can stop those who would instill the Middle East's violent religious habits in the United States. Khalid Durán recently noted how, given that "some two dozen" of his good friends have been killed in recent decades, his even being alive is a miracle. His security is now a trust that all Americans must safeguard. July 6, 2001 update: The Washington Post has an editorial today, "A Squabble and a Threat," that supports Durán against CAIR. Of course, I do often hear negative comments about Daniel Pipes' alleged bias against Muslims. My sense is that these derive from the fact that he is not a Muslim and favors strong U.S.-Israel ties. But if you take what Pipes is saying and writing about contemporary Islam, and give it a blind reading, you cannot distinguish it from what hundreds of critical Muslims are saying and writing. I have always been especially taken by the similarity of his views to those of Sayyid Qudratullah Fatimi, a historian and theologian of international renown and my mentor in Pakistan. I have shared Pipes' writings with friends from Afghanistan, Algeria, Bangladesh, Bosnia, Iran, Morocco, and Sudan. Even though they reject his opinions on Israeli policy, they find his writings on Islam stimulating and worthy of serious deliberation. In short, the man is no more a "Muslim-basher" than any of us critical Muslims. Durán is too modest about our reaching similar conclusions; it was his article, D. H. Khalid, "Das Phanomen der Re-Islamisierung," Aussenpolitik 29 (1978), p. 446, that inspired my thesis about the role of oil wealth in that 1979 article he alludes to, "This World is Political!! The Islamic Revival of the Seventies." Orbis, 24 (1980-81): 9-41. That same thesis about oil wealth also lies at the heart of the third section of my 1983 book, In the Path of God Islam and Political Power. Apr. 1, 2002 update: I distanced myself from the oil wealth thesis in a preface to the 2002 reissue of In the Path of God: Islam and Political Power. Apr. 18, 2010 update: Khalid Durán died today in Germany. Born April 4, 1939, he was 71 years old. Brave, learned, prolific, insightful, honest, he was a creative co-author and a devoted friend. I will severely feel his loss as will all those working to reform Islam and make it part of the modern world.